“¡Wow!” Eso fue lo que dije cuando vi esta cazadora de cuero granate en la percha. Me la probé enseguida y se la enseñé a mi hermana jejeje. ¡La podremos llevar todas! ¡Yuhu! (Las tres tenemos tallas parecidas). Ya tenía ganas de tener una cazadora de cuero de un color ‘poco común’ en mi armario jejeje: el granate (tengo una marrón y dos negras) y en cuanto ha empezado a refrescar… ¡ya he salido con mi cazadora! jajaja. Espero que os haya gustado el look de hoy. Y, como siempre, espero vuestros comentarios para saber qué os parece :). P.D. : ya están haciendo los últimos retoques al nuevo diseño, va quedando muuuuyyyyy pocooo. “Wow!” That’s what i said when I saw this burgundy leather jacket. I tried on immediately and showed to my sister hehehe. We all have similar sizes soo we can wear it! I wanted to buy a new leather jacket in a color not too common in my closet hehehe: burgundy (I’ve one in brown and 2 in black). I’ve worn it for the first time!! when it was a bit cold I picked my leather jacket jejeje. I mixed it with black pants and a tee, which call the weekend hehehe and a color or print to give my personal touch to the whole outfit: I chose animal print in 4 accessories (subtle touches) to not have a safari result hahaha. I hope you like today’s post and thanks for your time here! P.S. : The new design layout is just around the corner… stay tuned girls! p.s. : If you’ve really enjoyed this post as I’ve enjoyed creating it, tell me your thoughts on the comments below, help me out spreading the word and be the 1st to see the next blog outfits on my social networks. 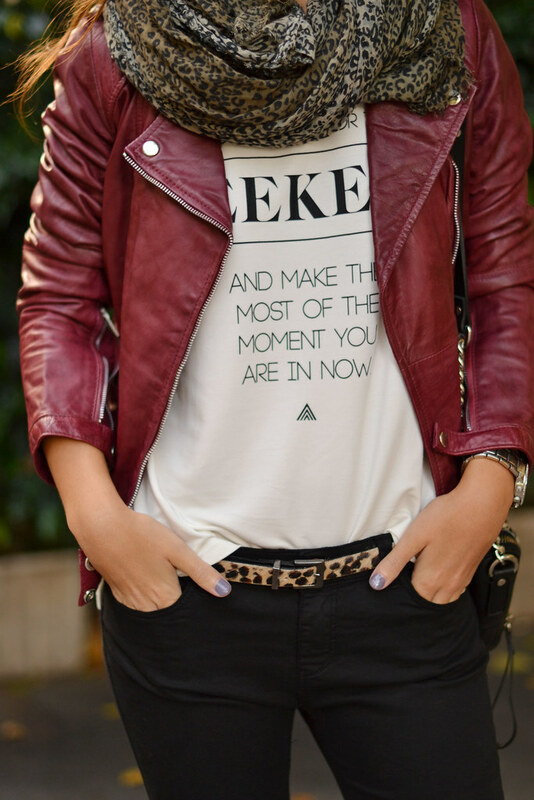 I love the color of your leather jacket, especially with the animal print scarf! Great outfit! Donde puedo conseguir esa chaqueta? Hace cuanto tiempo la compraste?